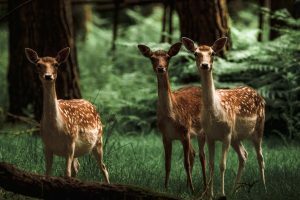 With more than 60 different species of deer worldwide, there’s a good chance individuals will have some sort of interaction with these majestic animals at one point during their lifetimes. Deer, which live on all continents except Antarctica, can survive in everything from mountainous areas to wet rainforests to suburban neighborhoods. These herbivores are voracious eaters that will search far and wide for their meals. Home landscapes tend to be easy pickings for foraging deer. Many people are excited to see deer in their neighborhoods and yards because they can be such graceful creatures to behold. However, once deer start to munch on ornamental trees, annuals and flowering shrubs, the novelty of these animals may wear off. Furthermore, deer also can be covered in ticks that spread illnesses like Lyme disease. Here are some tips to keep deer at bay. • Avoid tasty morsels. Deer like English ivy, lettuces, impatiens, pansies, and hostas. Fruit trees also are targets. Choose other plants to grow, and wait until after early spring, when deer aren’t as concerned with regaining weight lost during the winter, to get them in the ground. • Use fishing line to deter deer. Put a few stakes in the ground and then run fishing line at a height of about three feet. Deer can sense movement but do not have keen vision. As the deer approach your garden, they’ll brush against the “invisible” fishing line and then get spooked off. • Plant plants that produce strong aromas. The experts at Good Housekeeping suggest planting lavender and marigolds, which emit strong aromas. Deer will be reluctant to walk through because the smell can interfere with their ability to find food and assess their environment via their sense of smell. • Stock up on soap. The tallow in soap helps keep deer away, according to the University of Vermont Extension Department of Plant and Soil Science. Scented soaps like Irish Spring may be especially good at warding off deer. • Plant in levels. Raised beds and sunken gardens can discourage deer from coming into the yard because they aren’t avid climbers, offers the home and garden resource This Old House. • Employ harmless scare tactics. Deer are skittish, and any unfamiliar movement or sound may scare them away. Cans hung from strings, sundials and lights can keep them at bay. 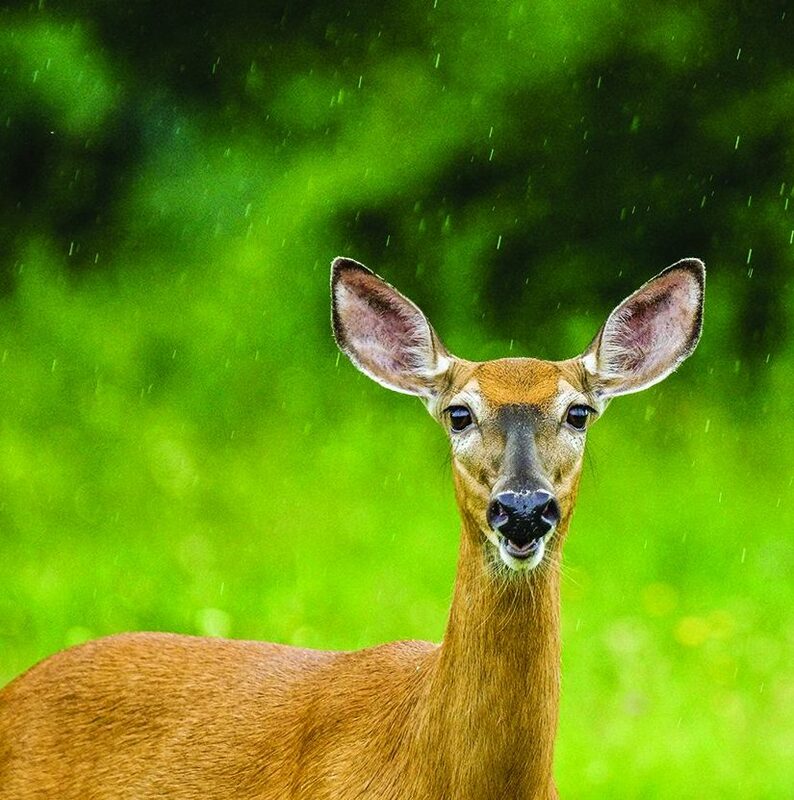 Deer will seek out an easy meal, but homeowners can take steps to safeguard their trees, flowers and shrubs. Flower gardens can add color and awe-inspiring appeal to a property. 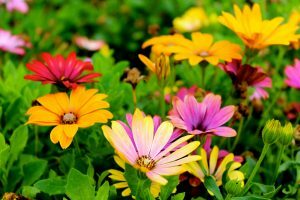 The National Gardening Association notes that gardeners can find nearly every color of the spectrum in flowering perennials. So whether you prefer soft pink, are partial to bright red or want to relax in a garden and gaze at something deep blue, chances are you’ll find a perennial to tickle your fancy. The NGA offers the following breakdown of colors to help gardeners learn how their gardens can set the mood they’re looking for. A garden full of bright colors like red, orange, magenta, and yellow can provide a landscape with vigor and energy. 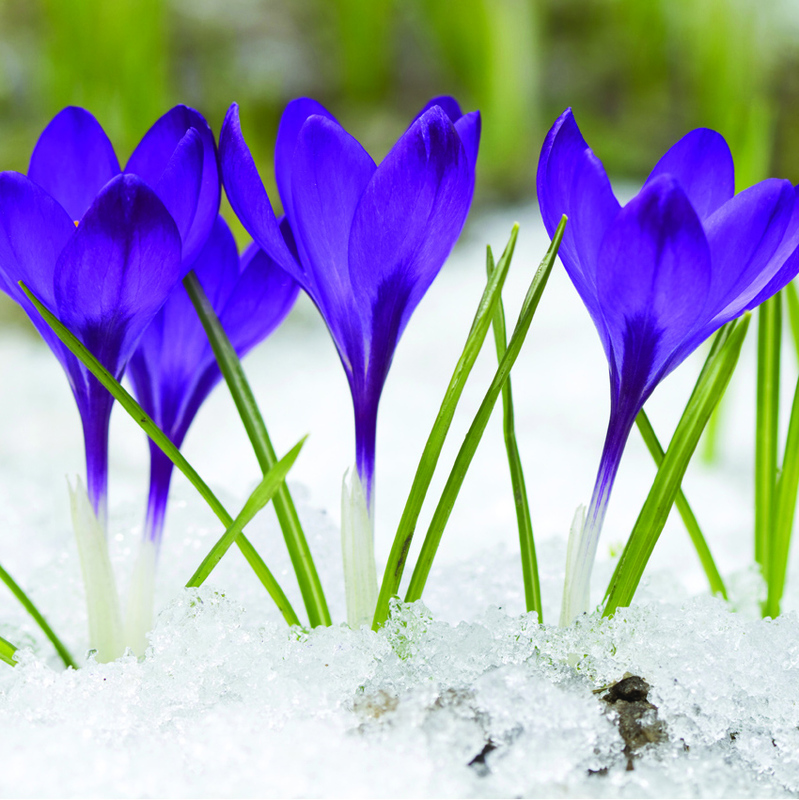 The NGA notes that brightly colored flowers can withstand especially bright sunshine, meaning gardeners can marvel at their appearance even when the sun might be adversely affecting other plants and flowers. Pastels, which include soft pink, powder blue, lavender, and peach, create a tranquil feeling in a garden. This makes pastel perfect for those who want their gardens to be a relaxing, peaceful respite from the hustle and bustle of everyday life. The NGA notes that pastels may looked washed out in the midday sun, so they might be best enjoyed early in the morning or late in the afternoon. Complementary colors are those that are opposite one another on the color wheel. Orange and blue are examples of complementary colors. According to the NGA, complementary colors can add creative energy and vitality to a garden. These colors are those that are next to each other on the color wheel, such as orange and red. 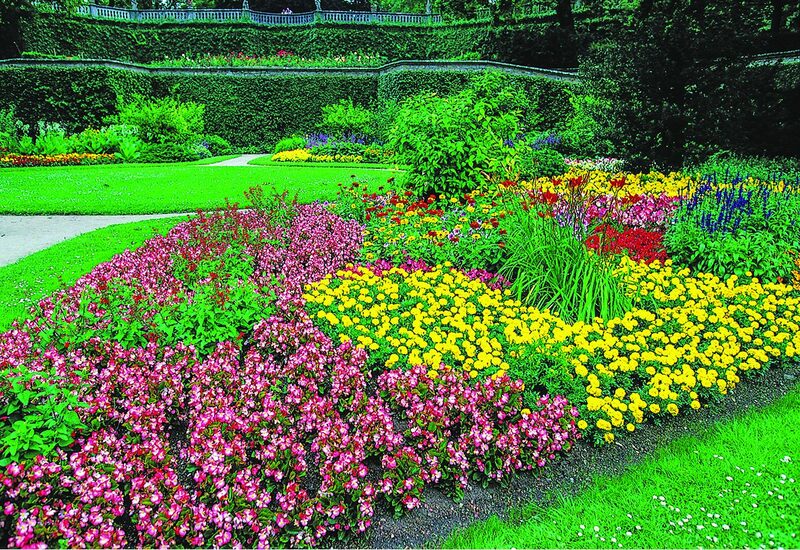 The NGA recommends harmonious colors for gardeners looking to create a unifying feel in their gardens without resorting to a monochromatic color scheme. Harmonious colors give off a gentle feeling that can make for a relaxing garden atmosphere. Monochromatic gardens can be awe-inspiring even though they stick to a single color and don’t provide an array of awe-inspiring colors. The NGA notes that gardeners with monochromatic gardens make them interesting by using plants of various sizes and shapes. When planting a garden, gardeners can choose whichever color scheme they prefer. To learn more about the effects of color on a garden, visit the National Gardening Association website at www.garden.org. Home improvement projects provide homeowners with a chance to put their own stamp on their homes. In addition, many such projects make homes safer and, in some instances, more eco-friendly. The opportunity to make a home more comfortable, safer and/or more eco-friendly entices many homeowners to open their wallets. In fact, the Home Improvement Research Institute estimates that the home improvement products market will grow by more than 5 percent in 2018. Homeowners might experience some sticker shock when researching home improvement projects or receiving estimates from contractors. But there are ways for budget-conscious homeowners to transform their homes and still make the most of their home improvement dollars. • Do your homework. 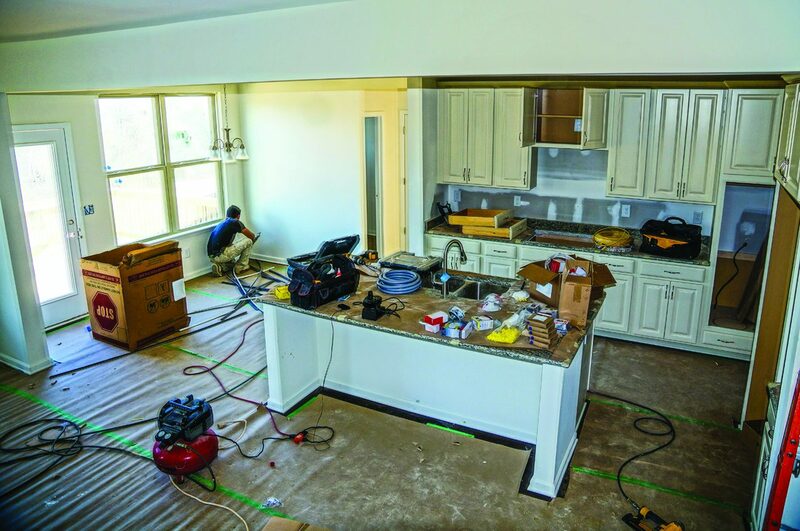 Each year, Remodeling magazine publishes its “Cost vs. Value Report,” a comprehensive study of 21 popular remodeling projects in 149 United States markets. The report notes the value each project retains at resale in 100 markets across the country. Homeowners who want to get the strongest return on investment can access the “Cost vs. Value Report” (www.remodeling.how.net) to see which home improvement projects are best suited for them. • Do some of the labor yourself. Homeowners willing to swing a hammer also can stretch their home improvement dollars. For example, the home improvement resource This Old House® notes that homeowners willing to do their own demolition before the contractors arrive can save substantial amounts of money. A professional contractor may charge $1,000 to demo a 200-square-foot deck, but This Old House estimates that homeowners who demo their own decks may spend only $450 (for the dumpster rental and parking permit). • Hire a consultant. The DIY movement is incredibly popular, no doubt thanks to television channels such as HGTV and the DIY Network. Homeowners with DIY experience may be able to complete projects on their own with little consultation from professional contractors. Some contractors may not offer consulting services, however. 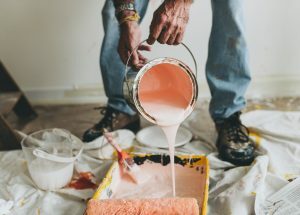 The consultation route, which typically requires paying licensed contractors hourly fees to offer guidance, should only be considered by homeowners with legitimate DIY skills, for whom this option can be a great way to save money. 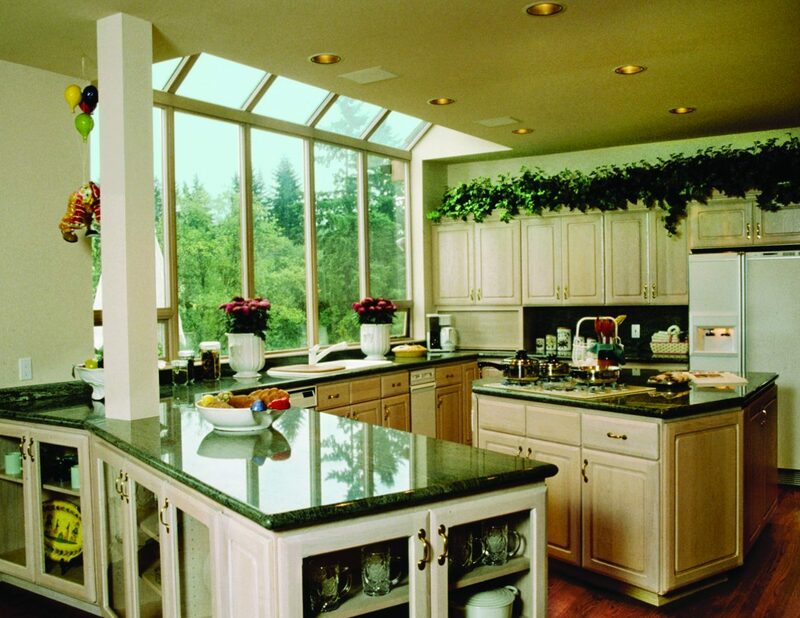 • Schedule renovations during homeowner-friendly times of year. Summer and fall tend to be contractors’ busy seasons, and homeowners will likely pay more for projects during this time of year. If possible, delay starting projects until right after the new year, when contractors aren’t so busy and might be more flexible with pricing. Budget-conscious homeowners can employ various strategies to make the most of their home improvement dollars without sacrificing quality. Many homeowners wish they had more storage space, and kitchens are one area where people seemingly can always use more storage. Despite a desire for more kitchen space, until recently, kitchen pantries fell out of favor. Builders and architects may have thought that close proximity to supermarkets as well as multi-use cabinets in kitchens would offset the need for pantries. But according to a recent survey from the National Association of Home Builders, a kitchen pantry is the most desirable kitchen feature for buyers in the market for a new home. According to a 2016 survey from ReportLinker, 98 percent of Americans say cooking at home is their preferred way to prepare a meal. And despite the wide array of restaurants, prepared meals and fast food options nearby, more than one-third of people cook at home daily, with nearly 50 percent cooking between three and six days a week. In order to accommodate for spending more time in the kitchen, homeowners are directing additional attention to kitchen preparation and storage features. In fact, one recent trend in kitchen renovations is creating custom-designed pantries. Ideally, pantries should be in or adjacent to the kitchen. But not every home layout allows for this setup. Some homeowners need to move storage pantries into the garage, the basement or a mud/laundry room. Various factors should be considered before placing a pantry outside a kitchen. What is the climate? Will food spoil? Is there a possibility that vermin or insects can infiltrate the room and access food? These factors will dictate whether to have closed cabinets, air-tight bins or open shelves or if other modifications must be made to the room prior to building. Accessibility is essential in a pantry. Everything should be easily reached and grabbed as needed without having to move too many things. Ideally, foods should be arranged in a single layer so that all items can be viewed at a glance. Shelves of various depths and heights can accommodate items of different sizes. Adjustable shelves are ideal because they can be modified as foods change. Sliding drawers can improve reach in cabinets. In smaller spaces, French door-style reach-in cabinets are convenient and flexible. In complete kitchen remodels or new constructions, walk-in pantries offer the most space and flexibility. Pantries serve different functions in different homes. For the bulk shopper, a pantry with plenty of room for large items will be needed. Lighting can be beneficial in all pantries. Lights can improve visibility when trying to locate items. Others prefer an outlet for charging hand-held vacuums or other small appliances. Counter space in the pantry enables homeowners to unload groceries directly onto pantry shelves. For pantries located outside of the kitchen, built-in freezers can maximize storage possibilities, especially for those who freeze-and-eat after bulk shopping ventures. Pantries are popular features that homeowners can customize depending on their storage needs and the amount of time they spend in their kitchens. 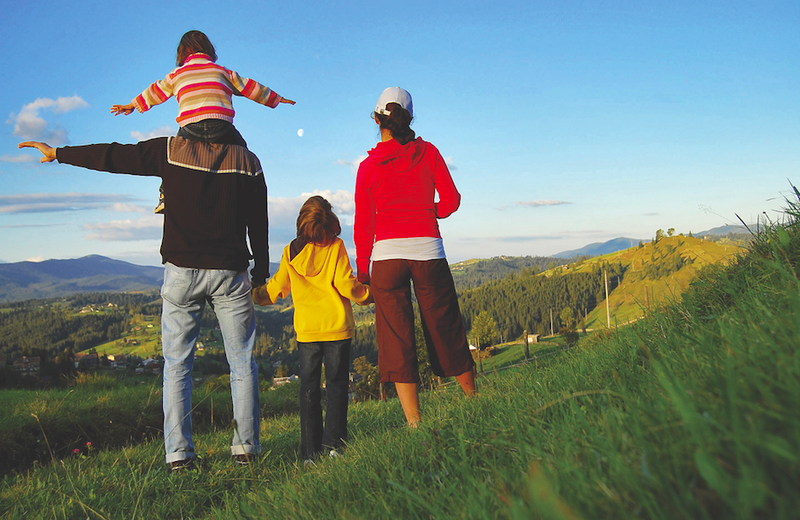 Family vacations can seem like daunting endeavors to organize, as planners must cater to each member of the family and their individual needs. Family vacations can cost several thousand dollars, which only adds to the pressure planners may be under. But careful planning makes it possible to simplify the process so more time can be spent resting, relaxing and having fun. One of the “musts” when booking a family vacation is finding the right accommodations. This often means booking rooms at family-friendly hotels. Things to look for when seeking hotels include amenities like swimming pools and recreation areas, nearby parks and other attractions that kids can enjoy, and easy access to stores that sell necessities. When booking a room, request one that is close to the elevator or the breakfast buffet. If you have youngsters who nap or go to bed early, try to book adjoining rooms or one-bedroom suites. This way the kids are tucked in but accessible, allowing adults to enjoy their downtime. Get the entire family involved when planning a vacation and let children who are old enough to have a say in some of the travel plans. Let kids choose some activities, pick some restaurants or even select which seats to sit in on the airplane. Pack light and, if possible, buy some necessities when you arrive. Few things can be as headache-inducing as dragging along extra luggage with kids in tow. Choosing a hotel or resort with laundry facilities can be advantageous to active families who may get messy along the way. While it’s beneficial to have an itinerary, leave some moments for spontaneity and rest. You don’t want to return home so tired from the trip that you need another break. Use downtime as opportunities for kids to lead the way. Mature children may like sights and sounds that aren’t necessarily designed for kids. So while it may be tempting to stick to big-name resorts that cater to families, there’s plenty of enjoyment to be had exploring lesser-known islands or villages. And while you’re at it, introduce children to native cuisines so they can broaden their culinary palates. Make lasting vacation memories more by putting together a photo album or scrapbook. Be ready to enjoy the warm days of spring and summer with an “updated” outdoor dining/living/garden area that is welcoming and efficient. Woodcraft has the tools and supplies you will need, along with helpful advice at your local store and free how-to articles on Woodcraft.com. Take stock of your outdoor furniture — do you need more? Would colorful new Adirondack chairs, a new picnic table and maybe a garden bench and planters be more inviting? Or perhaps a cleanup and new paint would bring your existing furniture to life for another season? Does your porch/patio/deck area need to be resurfaced or enlarged? Streamline your dining by building mobile carts to transport food for prep and for serving. Add a butcher block top to the food prep cart and storage drawers to both, and improve the efficiency and pleasure of your dining experience. Gardeners may want to build a potting bench and wooden flatbed wagon to haul plants and supplies. “Make anywhere your workspace with the Kreg Mobile Project Center,” Woodcraft senior product manager Peter Collins said. “It’s a portable workbench, sawhorse, assembly table, and clamping station all in one that provides a versatile work space for DIY, repair, and woodworking projects.” The large 273⁄4″ x 311⁄2″ polypropylene work surface supports a 350-lb. load capacity, and two centers can be connected to double the work area. Collins also suggested adding the new Kreg In-line Bench Clamp and Bench Clamp System for Dog Holes to make almost every clamping task possible. Visit Woodcraft.com to see Building Plans for Outdoor Furniture, as well as Adirondack chair templates. Woodcraft.com also offers a large number of how-to articles such as “Laid Back in a Classic Adirondack” that shows how to build with Adirondack chair templates, while “WoodSense: Spotlight on Outdoor Projects,” describes woods that work well outdoors. For building projects, the Freeman 11⁄4″ 18-Gauge Brad Nailer is a professional quality, innovative home improvement tool that is great for furniture. Its oil-free operation requires no regular maintenance and eliminates the risk of stains on project surfaces. If your joinery choice requires screws, the Groz Insta Drive Screwdriver features a patented retractable, rotating bit cartridge that makes it easy to find, store and change driver bits. For hauling lumber or other large items to your project site, use the Xstrap Heavy Duty Ratchet Tie Down to hold up to 1,000 pounds in place on a truck bed. To finish new furniture or recolor existing pieces — and brighten your outdoor landscape — choose one of the 28 premixed General Finishes Milk Paint colors that can be mixed, lightened, glazed, layered, antiqued, or distressed. Other good choices for outdoor surfaces include General Finishes Outdoor Oil Finish (use over exterior oil stain or exterior clear oil finishes for additional protection) and General Finishes 450 Varnish (minimizes fading, retards mold and fungus growth). For painting guidance, watch “Hand Applied Milk Paint from General Finishes at Woodcraft” and read “Create a Milk Paint Masterpiece” on Woodcraft.com. HOMERIGHT’s Finish Max HVLP Sprayer will spray most solvent (except lacquer and conversion varnish) or water-based products — latex paint, milk paint, chalk paint, furniture paint, stains, and finishes. It’s easy to set up, use and clean. When painting furniture, consider using the HOMERIGHT Large Spray Shelter. When painting small accessories, opt for the Small Spray Shelter. For furniture that needs some TLC, read “Restoring Outdoor Projects” on Woodcraft.com to learn how to determine what needs to be deep cleaned, repaired, rebuilt and repainted. Handy helpers for the TLC process include Blue Bear Paint and Urethane Stripper, Krud Kutter No-Rinse Prepaint Cleaner, Titebond III Ultimate Wood Glue, SculpWood Putty, and Briwax ChaiRX. Turn a unique transplanter, cultivator and weeder with the three-piece WoodRiver Garden Tool Turning Kit constructed of durable, cast aluminum. Turning blanks for the handle, sold separately, may be made from wood, acrylic or another man-made material. Build a wooden croquet set with help from “Picnic Perfect Croquet Set” in Issue 65 of Woodcraft Magazine. Subscribers can download the article free, or the issue can be purchased at Woodcraft.com. To learn more about these and other products, visit your local Woodcraft store, call (800) 535-4482 or visit www.Woodcraft.com. Summer may be a time for vacations and recreational activities for human beings, but pets may not be privy to the same luxuries. Summer recreation may not always include our four-legged friends, as summer heat and other issues can pose a threat to companion animals. As a result, pet parents must make pet safety a priority when the weather heats up. The Humane Society of the United States says that the summer months can be uncomfortable and dangerous for pets. Temperatures that may be tolerable for adults and children who are dressed accordingly may not be so for animals covered in fur. It’s vital to help pets stay comfortable and safe as summer temperatures heat up. Pet parents also must be aware of particular dangers that go hand-in-hand with summertime activities. · Practice vehicle safety. It is never acceptable to leave pets in parked cars, even for a minute. Temperatures inside vehicles can rise quickly and considerably in a matter of minutes, even with the windows opened slightly. HSUS says on an 85-degree-day, temperatures inside parked cars can reach 102 F within 10 minutes. Pets can suffer irreversible and even fatal organ damage in that period of time. If you have to run errands, keep dogs and cats at home where they will be more comfortable. · Stay off of hot asphalt. If you’ve ever walked on the hot sand or an asphalt driveway on a hot day, you understand just how scorching those surfaces can get. Dogs and cats do not have protective shoes to wear, so safeguard the delicate pads of their paws by keeping companion animals off of hot surfaces. Schedule walks in the early morning or late afternoon when temperatures are cooler. · Schedule a pet grooming visit. The American Veterinary Medical Foundation suggests speaking with your veterinarian to see if it’s appropriate for your pet to get clipped shorter or to be shaved in the summer. But a fur coat can offer protection from the sun, so weigh the pros and cons before taking action. Apply sunscreen to your dog’s skin if he or she has a thin coat. · Provide a way for pets to cool off. 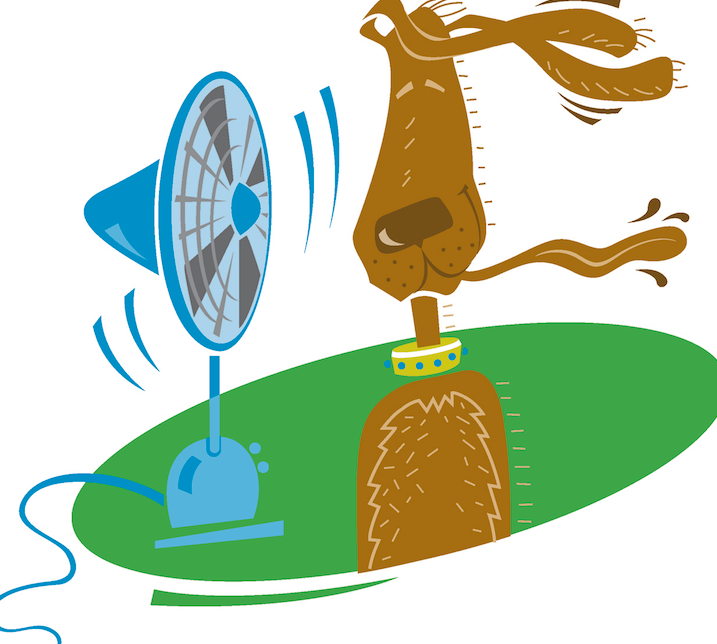 If you’re hot, chances are your pet is hot, too. Offer a means for pets too cool off, such as a wading pool when you are outside. Offer plenty of fresh water. Keep pets who do not enjoy the heat indoors with the air conditioner running on hot days. 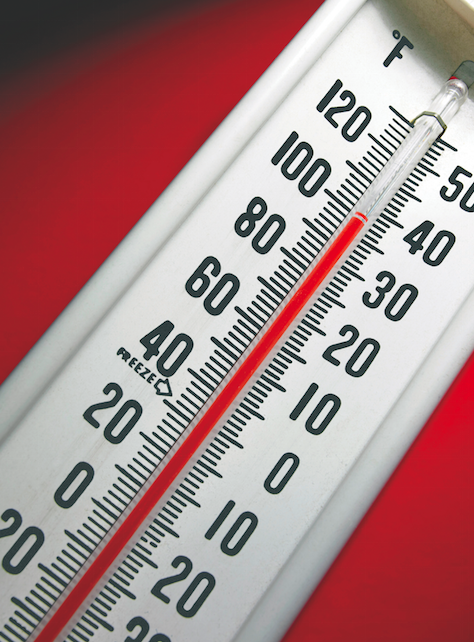 · Look for indicators of heat stress. The American Veterinary Association says heat stress is marked by heavy panting, dry or bright red gums, thick drool, vomiting, diarrhea, or wobbly legs. Move pets exhibiting such symptoms to a cool place, drape a damp towel over the animal’s body, rewetting the cloth frequently, and get the animal to the vet as soon as you possibly can. · Exercise caution in the water. Dogs can get swept away by rip currents just like human swimmers. If you will be boating, invest in a life jacket for your pooch and look for water hazards, such as currents, sink holes, and blue-green algae in lakes and ponds. The month of August is often referred to as “the dog days of summer,” a phrase that can be traced back to the ancient Greeks and Romans. The “dog days” are a reference to the dog star, Sirius, which appeared to rise just before the sun in late July, when temperatures were at their hottest. As a result, the phrase “dog days” remains synonymous with summer heat in the Northern Hemisphere. Keeping cool during the dog days of summer can be difficult, especially for people who live in humid climates. According to the Environmental Protection Agency, heat is the leading weather-related killer in the United States, with the National Vital Statistics System reporting a total of more than 7,400 deaths between 1999 and 2010. Many of those deaths could have been prevented had people taken steps to keep cool in the face of summer heat. · Choose wisely when spending time outdoors. As hot as summer can be, many people still want to enjoy some time outdoors. You don’t have to spend summer indoors to survive the summer heat, but it helps to choose the time you spend outdoors wisely. Avoid spending time outdoors between the hours of 10 a.m. and 3 p.m. Temperatures soar and peak during these hours, and the American Melanoma Foundation notes that UV radiation reaches its peak intensity at approximately 1 p.m. The more intense that UV radiation is, the more susceptible people are to UV-related sun damage to their skin. If you prefer to exercise outdoors during the summer, do so in the early morning or in the evening, when temperatures tend to be lower and UV radiation is less of a threat. · Limit time spent outside. It’s okay to spend time outside in the summer, just make sure you are not outside for extended periods of time on hot days. Exposure to sustained heat can adversely affect the body’s ability to sweat. Sweat might be uncomfortable, but it helps to regulate body temperature by cooling the body. People who cannot sweat or suddenly stop perspiring can succumb to heat exhaustion or heat stroke very quickly. If you must spend time outdoors on hot days, take periodic breaks to go indoors, heading inside immediately if you realize your body is no longer producing sweat. · Stay hydrated. Come the dog days of summer, keep a water bottle with you at all times, refilling it throughout the day as necessary. The American Heart Association notes that the heart can more easily pump blood through blood vessels to the muscles when it is hydrated. That means the heart isn’t working as hard as it would have to if you were not staying hydrated. Dehydration reduces the body’s ability to sweat and maintain a normal body temperature, so stay hydrated on hot days by drinking water throughout the day. · Make cool dietary choices. When planning meals on hot days, choose light foods and opt for small portions so you aren’t fighting feelings of sluggishness that can compound any heat-related feelings of listlessness you’re already coping with. In addition, choose meals that don’t require you to turn on the oven. Hot ovens can make homes, even those with fully functioning air conditioning systems, far less comfortable on especially hot days. The dog days of summer are often marked by humidity and blazing sun. Overcoming those factors may require altering certain habits. 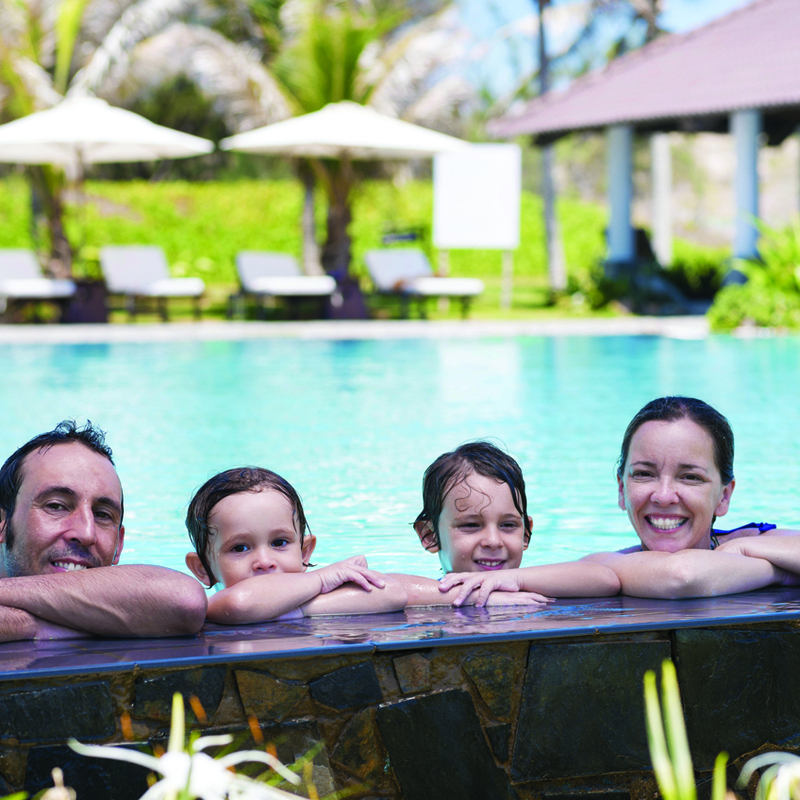 Family vacations provide wonderful opportunities for families to bond and make lasting memories. But such opportunities do not come without a price, and that price is oftentimes very steep. According to the 2015 TripBarometer study from popular travel website TripAdvisor, travelers across the globe are open to spending more on travel in 2016 than they have in the past. The study, conducted on behalf of TripAdvisor by the independent research firm Ipsos, analyzed more than 44,000 responses from travelers and hoteliers across the globe. Thirty-three percent of respondents plan to spend more on travel in 2016 than they did in 2015, while 31 percent admitted that they plan to spend more on travel because it’s important for their health and well-being. Those figures are good news for the travel industry, but travelers, especially parents who plan to vacation with their children, should expect to encounter rising room rates when planning their trips. That’s because nearly half of all hoteliers surveyed indicated their intentions to increase room rates in 2016. While that might scare off some budget-conscious travelers, parents should know there are ways to cut the costs of family vacations. · Consider alternative accommodations. Families accustomed to staying in hotels while on vacation may be able to save by exploring some budget-friendly alternatives to hotels. Vacation rental properties, which may include private homes or condominiums, may charge less per day than four- or five-star hotels in the same city. Before booking accommodations, parents should explore all lodging options, including online bed and breakfast websites that may showcase private homes that boast lower nightly rates than large hotel chains. · Book through a travel agency. Many travelers now book their own vacations through popular do-it-yourself travel websites such as Orbitz, but going it alone may not be the most cost-effective approach for families. Many travel agency representatives are accustomed to working with travelers who are on a budget and building vacations that include all the sights their clients want to see for the amount they’re willing to spend. Travel agency representatives typically have considerable connections in the countries they specialize in, and those connections can produce memorable experiences at lower costs than travelers would likely pay booking the trips on their own. In addition, many travel agencies include the cost of admissions to various sights in their packages, making it easier for travelers to budget for their trips. · Scour discount websites for deals. E-commerce marketplaces such as Groupon aren’t just for date nights at home. Such websites and services also provide domestic and international travel deals. Families can book entire trips through such websites, many times at considerable discounts, or scour the sites for deals on sightseeing opportunities in the cities where they will be vacationing. · Plan to cook. Meals can quickly consume travelers’ budgets. The Consumer Expenditure Survey released in 2015 by the U.S. Bureau of Labor Statistics indicated that food and alcohol can take up about 16 percent of the budget for international travelers, and 27 percent for domestic travelers. Such estimates seem low and might reflect the difficulty surveyors had distinguishing between travelers who visited friends and family, and subsequently spent little on food, and travelers who had to purchase all of their vacation meals. Families can cut meal costs by planning to do some of their own cooking. Rental properties and extended stay hotels are typically equipped with full kitchens, which can help parents save money without sacrificing the quality of their vacations. Families looking forward to their next vacations can implement several strategies to make those trips affordable.